Infinite Art Tournament: Know Your Italian C-Artists! Artist's Statement: His use of dynamic composition, illusionistic perspective, and dramatic foreshortening made him responsible for some of the most vigorous and sensuous works of the 16th Century. Which is to say: He made things look really lifelike. Fun Fact: Apparently he was basically self-taught, and had no known apprentices. Legacy: Successful in his day and influential afterwards. He was especially popular with the Grand Tour Victorians. Artist's Statement: He employed a radical naturalism which combined close physical observation with a dramatic, even theatrical, use of chiaroscuro. Which is to say: He was really good at painting people and using lighting effects. Fun Fact: The Pope put a price on his head. Legacy: Forgotten after death; rediscovered in 20th Century. Currently considered Very Big Deal. Artist's Statement: His compositions are distinguished by a beautiful flow of melody and by a mannerly treatment of the accompanying parts, which he is justly said to have liberated from the strict rules of counterpoint. Which is to say: Hey, this guy's not even a painter! Personal Issue: Had trouble with high notes. Fun Fact: Wow, a composer that died rich and famous! Legacy: Probably one of the most important figures in the evolution of western music. 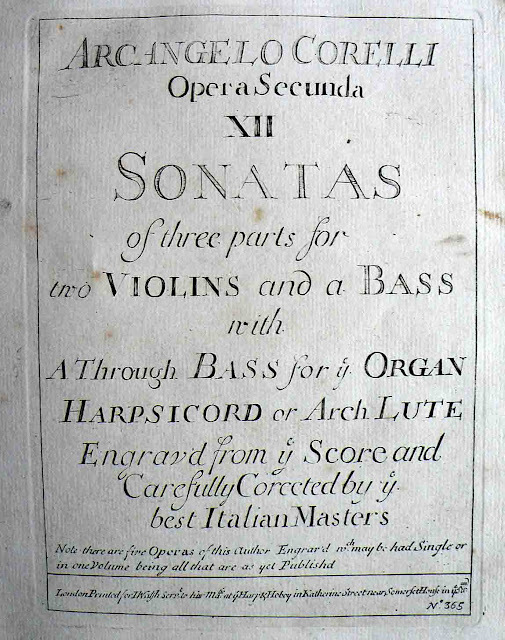 Corelli - Sonatas of Three Parts for Two Violins and a Bass, etc. Artist's Statement: Best known for dramatic and picturesque views of Venice, marked by strong contrasts of light and shade and free handling and executed with accuracy, precision, and luminosity. Which is to say: He painted really vivid landscapes. Fun Fact: Lived in England for a decade to be closer to his market. Legacy: Pretty much owns the paintings-of-canals niche. Did you make the last guy up? Corelli: "Probably one of the most important figures in the evolution of western music." I'd like to hear more about that! "Although Corelli was not the inventor of the Concerto Grosso principle, it was he who proved the potentialities of the form, popularized it, and wrote the first great music for it. Through his efforts, it achieved the same pre-eminent place in the baroque period of musical history that the symphony did in the classical period. Without Corelli's successful models, it would have been impossible for Vivaldi, Handel, and Bach to have given us their Concerto Grosso masterpieces." (sez here) And then the Viennese Classical tradition grows out of the Concerto Grosso form, yadda yadda yadda, Bob's your Uncle! 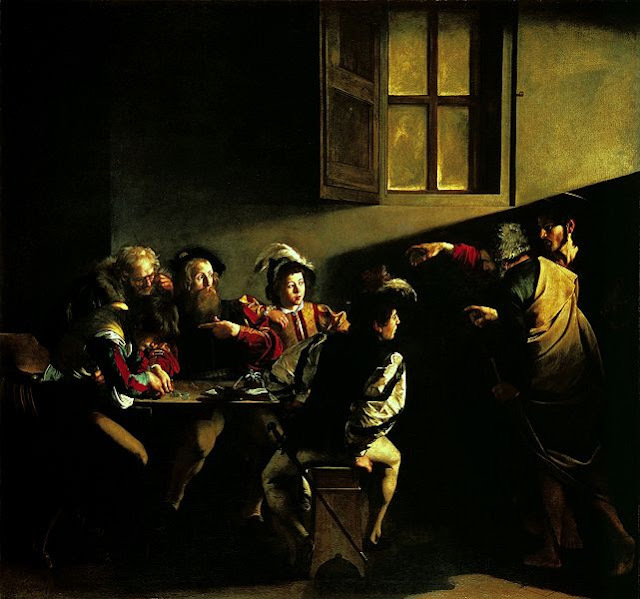 Okay, just to be pedantic: 'chiaroscuro' was the use of light/dark juxtaposition to create an illusion of depth. However, it was generally crudely applied, and figures looked blocky rather than realistic. See early painters in the Fra Lippo Lippi era, and following. I didn't realize you knew these guys personally. Which one would you invite to a dinner party? So if you didn't make him up, was his name Giovanni Antonio Canal or Canaletto? Did he change his name to match the canals? Did he take up canal painting to take advantage of his name? Did he time travel to the appropriate pre-Roman period and tell the natives that reeds were called canna, trusting that the word would change to canalis, become established in Latin meaning 'water channel' and then pass into Italian to match his surname? 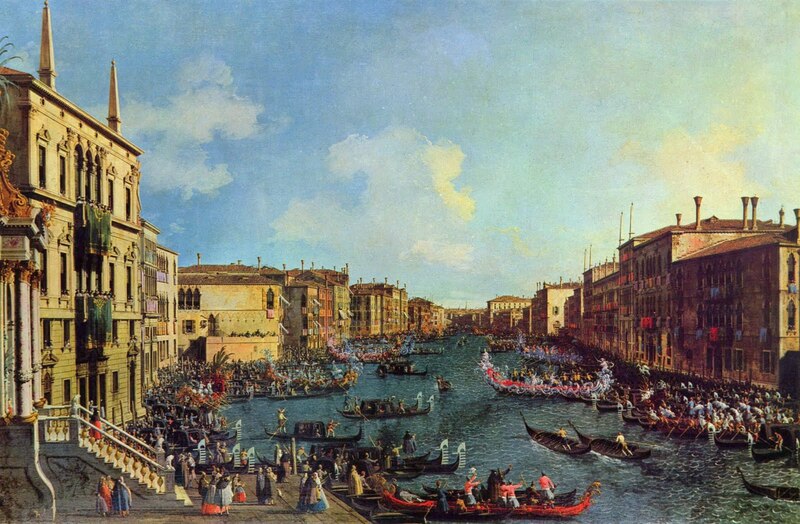 Canaletto was real; maybe his family was in on the first canals? But canals aren't named after his family, the root comes down from Latin. Oh but you mean maybe his family originally got their name from the canals. That's a much better supposition. I think the Canaletto-painted-Canals thing is mostly just coinkidink, although I wonder sometimes if the helpful mnemonic might have helped him reach and remain on the Great Artist list. Canal is I think a reasonably common Italian name -- though I pull this out of, um, thin air -- and "Canaletto" is just "little Canal," Junior, a name he would have picked up in youth to distinguish him from his dad.